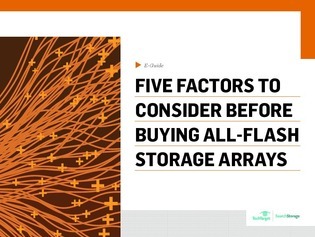 While all-flash arrays (AFAs) can provide much higher levels of performance than disk-based arrays, they are not, however, the right fit for all storage needs. To get the most out of the expenditure, you need to determine not only which apps need the speed and power of all-flash—budget, integration with existing infrastructure, and maintenance subscriptions all come into play. Which of my apps will benefit most from AFAs? How should I integrate AFAs into my existing infrastructure? Should we use AFAs from the vendor that makes our existing storage?